Currently approved antidepressant drug treatment typically takes several weeks to be effective. The noncompetitive N-methyl-d-aspartate (NMDA) receptor antagonist ketamine has shown efficacy as a rapid-acting treatment of depression, but its use is associated with significant side effects. We assessed effects following blockade of the glycineB co-agonist site of the NMDA receptor, located on the GluN1 subunit, by the selective full antagonist 7-chloro-kynurenic acid (7-Cl-KYNA), delivered by systemic administration of its brain-penetrant prodrug 4-chlorokynurenine (4-Cl-KYN) in mice. Following administration of 4-Cl-KYN, 7-Cl-KYNA was promptly recovered extracellularly in hippocampal microdialysate of freely moving animals. The behavioral responses of the animals were assessed using measures of ketamine-sensitive antidepressant efficacy (including the 24-hour forced swim test, learned helplessness test, and novelty-suppressed feeding test). In these tests, distinct from fluoxetine, and similar to ketamine, 4-Cl-KYN administration resulted in rapid, dose-dependent and persistent antidepressant-like effects following a single treatment. The antidepressant effects of 4-Cl-KYN were prevented by pretreatment with glycine or the α-amino-3-hydroxy-5-methyl-4-isoxazolepropionic acid (AMPA) receptor antagonist 2,3-dihydroxy-6-nitro-7-sulfamoyl-benzo[f]quinoxaline-2,3-dione (NBQX). 4-Cl-KYN administration was not associated with the rewarding and psychotomimetic effects of ketamine, and did not induce locomotor sensitization or stereotypic behaviors. Our results provide further support for antagonism of the glycineB site for the rapid treatment of treatment-resistant depression without the negative side effects seen with ketamine or other channel-blocking NMDA receptor antagonists. Although interventions for major depressive disorder (MDD) such as pharmacotherapies and cognitive behavioral psychotherapies are available, more than 30% of patients remain treatment-resistant. Even when effective, currently used monoaminergic drugs often take up to several months to exert their full therapeutic effects (Rush et al., 2006). Moreover, compelling evidence suggests a key role for the glutamatergic system in mood disorders (Popoli et al., 2012). Tissue glutamate levels are higher in the brain of depressed patients compared with healthy individuals (Sanacora et al., 2012), and evidence indicates that the N-methyl-d-aspartate (NMDA) subtype of glutamate receptors can be successfully targeted for the treatment of MDD (Pittenger et al., 2007). Placebo-controlled trials have demonstrated rapid-acting antidepressant effects, within hours, of subanesthetic doses of the noncompetitive NMDA-receptor antagonist ketamine in treatment-resistant depressed patients [see Duman (2014)]. Moreover, antidepressant effects of ketamine have been demonstrated in several relevant tests in experimental animals [see Browne and Lucki (2013)]. However, ketamine’s potential as a long-term antidepressant medication is limited by its addictive properties and its anesthetic, cognitive, and psychotomimetic side effects (Krystal et al., 1994). Activity of the NMDA receptor requires binding of glycine or D-serine to an obligatory co-agonist (“glycineB”) site, which is located on the GluN1 subunit (Leeson and Iversen, 1994; Danysz and Parsons, 1998). 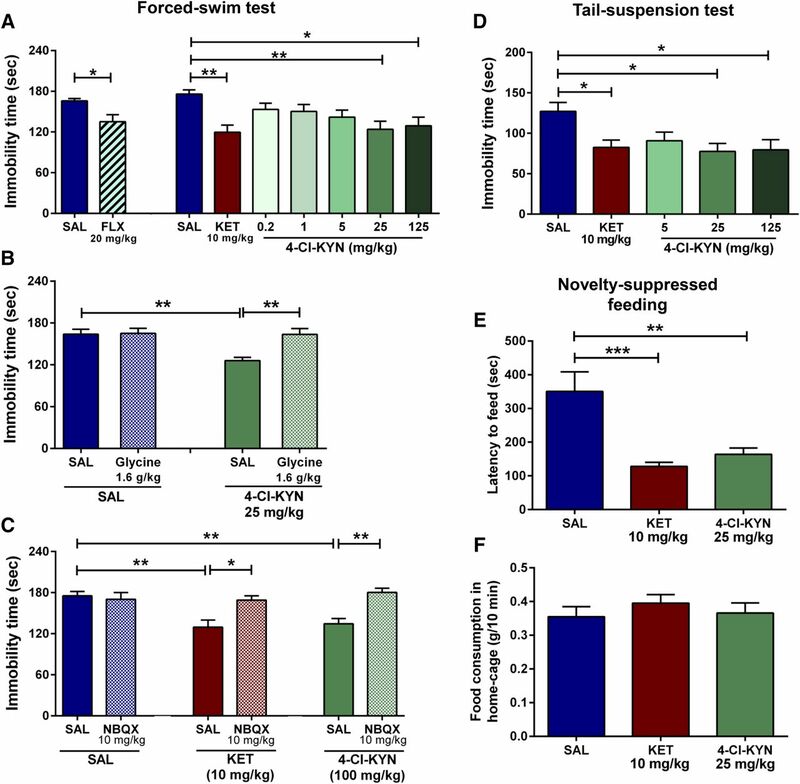 Although efficacy of glycineB receptor blockade by a full antagonist has been demonstrated in tests in mice sensitive to selective serotonin reuptake inhibition (Przegalinski et al., 1998; Poleszak et al., 2007), limited work has assessed actions in ketamine-sensitive tests predictive of rapid-acting antidepressant efficacy. 7-Chlorokynurenic acid (7-Cl-KYNA) is a potent and highly selective competitive glycineB receptor antagonist that has been widely used as a pharmacological probe to study the biology of the NMDA receptor (Kemp et al., 1988). Although the therapeutic use of 7-Cl-KYNA is limited by its poor penetration of the blood-brain barrier, it can be enzymatically formed from its prodrug 4-chlorokynurenine [4-Cl-KYN; Salituro et al. (1994)], which readily enters the brain after systemic administration (Hokari et al., 1996) and is then converted to 7-Cl-KYNA within astrocytes [Wu et al. (1997); Fig. 1A]. Extracellular levels of 7-chorokynurenic acid studied by microdialysis. (A) Schematic representation of 7-chlorokynurenic acid (7-Cl-KYNA) production from 4-chlorokynurenine (4-Cl-KYN) in the brain. 4-Cl-KYN readily enters the brain from the circulation and is then converted to 7-Cl-KYNA by kynurenine aminotransferase (KAT) in astrocytes. (B) Hippocampal microdialysis in freely-moving mice. The arrow indicates intraperitoneal injection of 7-Cl-KYNA (25 mg/kg) or 4-Cl-KYN (25 mg/kg). Data are the mean ± S.E.M. (n = 6/group). Inset: area under the curve (AUC); unpaired Student’s t-test. ***p < 0.001. In the present study, we evaluated the antidepressant efficacy and side effect profile of 4-Cl-KYN in comparison with ketamine and, in some experiments, with the selective serotonin reuptake inhibitor fluoxetine (FLX). Our results provide direct support for targeting the glycineB site in the treatment of MDD and indicate that the prodrug approach using 4-Cl-KYN holds promise for use in humans, without the negative side effects seen with ketamine or related NMDA receptor antagonists. Male CD-1 mice (seven-weeks old on arrival; Charles River Laboratories, MA) were housed in groups of four or five per cage with a 12-hour light/dark cycle (lights on at 07:00). Food and water were available ad libitum. Mice acclimatized to the new environment for 7 days prior to the start of the experiments. All experimental procedures were approved by the University of Maryland, Baltimore Animal Care and Use Committee and were conducted in full accordance with the National Institutes of Health Guide for the Care and Use of Laboratory Animals. Ketamine-HCl and glycine (Sigma-Aldrich, St. Louis, MO), NBQX, and FLX (National Institute of Mental Health Chemical Synthesis and Drug Supply Program) were dissolved in 0.9% saline. 4-Cl-KYN (provided by VistaGen Therapeutics, Inc., South San Francisco, CA) and 7-Cl-KYNA (Tocris Bioscience, Ellisville, MO) were suspended in 0.1 N NaOH until fully dissolved and neutralized with 0.1 N HCl before injection. All drugs were administered intraperitoneally in a volume of 7.5 ml/kg of body mass. Microdialysis in freely-moving mice was carried out as previously described (Potter et al., 2010). Animals were anesthetized with chloral hydrate (360 mg/kg) and mounted in a stereotaxic frame. A guide cannula (outer diameter: 0.65 mm) was positioned over the dorsal hippocampus (AP: 2.2 mm posterior to bregma, L: 2.0 mm from the midline, V: 1.1 mm below the dura) and secured to the skull with an anchor screw and acrylic dental cement. A concentric microdialysis probe (membrane length: 1 mm; SciPro, Sanborn, NY) was then inserted, extending 1 mm beyond the tip of the guide cannula. The probe was subsequently connected to a microinfusion pump set to a speed of 1 μl/min and perfused with Ringer solution containing 144 mM NaCl, 4.8 mM KCl, 1.2 mM MgSO4, and 1.7 mM CaCl2, pH 6.7. Microdialysate samples were collected every 30 minutes for eight hours. 4-Cl-KYN or 7-Cl-KYNA was administered 2 hours after the initial collection of baseline fractions. 7-Cl-KYNA levels were measured by high-performance liquid chromatography, using fluorescence detection (excitation wavelength: 344 nm; emission wavelength: 398 nm), as described (Lee and Schwarcz, 2001). Briefly, 20 μl of the microdialysate were subjected to a 3-μm C18 reverse phase column (80 × 4.6 mm; Thermo Scientific, Waltham, MA). 7-Cl-KYNA was isocratically eluted at a flow rate of 1 ml/min using a mobile phase containing 250 mM zinc acetate, 50 mM sodium acetate, and 8% acetonitrile, pH 6.2. The retention time of 7-Cl-KYNA was ∼8 minutes. Binding profiles and Ki determination data of 7-Cl-KYNA and 4-Cl-KYN for a broad panel of receptors and channels were provided by the National Institute of Mental Health Psychoactive Drug Screening Program (University of North Carolina, Chapel Hill, NC). For all radioligand receptor assay methods, see the Psychoactive Drug Screening Program web site (http://pdsp.med.unc.edu) as well as previously published protocols (Besnard et al., 2012). Experimental details for the binding assays are provided in Supplemental Table S2. All behavioral experiments were performed during the light phase. Ketamine was used as a positive control in all of the behavioral experiments. The dose used routinely (10 mg/kg) was previously shown to exert antidepressant effects in mice (Maeng et al., 2008; Ma et al., 2013; Antony et al., 2014). Saline, FLX (20 mg/kg), ketamine (10 mg/kg), or 4-Cl-KYN (0.2, 1, 5, 25, or 125 mg/kg) was injected, and mice were tested in the forced-swim test (FST) 1 hour or 24 hours postinjection. During the FST, mice were subjected to a 6-minute swim session in clear Plexiglas cylinders (30 cm height × 20 cm diameter) filled with 15 cm of water (23 ± 1°C). The FST was performed in normal light conditions (800 lux). Sessions were recorded using a digital videocamera. Immobility time, defined as passive floating with no additional activity other than that necessary to keep the head above water, was scored for the last 4 minutes of the 6-minute test by a trained observer blind to the treatment. In a separate cohort of animals, glycine [1.6 g/kg, i.p. ; Evoniuk et al. (1991); Javitt et al. (1999)] was administered 10 minutes prior to injection of saline or 4-Cl-KYN. Since a leading hypothesis of ketamine antidepressant action involves the activation of AMPA receptors (Maeng et al., 2008; Li et al., 2010; Autry et al., 2011), we also assessed the role of this receptor in the antidepressant effects of 4-Cl-KYN by pretreatment with the AMPA receptor antagonist NBQX (10 mg/kg) 5 minutes prior to injection of saline, ketamine, or 4-Cl-KYN, and assessed behavior 1 hour later in the FST. The TST was performed as previously described by Can et al. (2012). Animals were tested 1 hour postinjection of saline, ketamine (10 mg/kg), or 4-Cl-KYN (5, 25, or 125 mg/kg). Mice were individually suspended from the tail in suspension boxes (55 cm height × 60 cm width × 11.5 cm depth; Four-Hour Day, Baltimore, MD) for 6 minutes using a 15-cm long tape attached to the end of their tails. TST was performed under normal light conditions (800 lux). The test session was recorded using a digital videocamera. All videos were scored by a trained observer blinded to the treatment. Immobility time was measured for the entire 6-minute session. A mouse was considered immobile when it hung passively. The novelty-suppressed feeding test (NSF) was performed as described (Warner-Schmidt and Duman, 2007), with minor modifications. Briefly, mice were singly housed and food-deprived for twenty-four hours in freshly made home-cages. Two normal chow diet pellets were placed on a square food platform (10 × 10 cm) in the center of an open-field arena (40 × 40 cm). Thirty minutes after saline, ketamine, or 4-Cl-KYN administration, mice were introduced into a corner of the arena for 10 minutes. The time needed for the mice to take a bite of food was recorded by a trained observer blind to the treatment groups. After the test, the mice were returned to their home-cages containing preweighed food pellets, and latency to bite the food as well as consumption was recorded for a period of 10 minutes. As in previously published procedures (Maeng et al., 2008), the learned helplessness (LH) paradigm consisted of three different phases, i.e., inescapable shock training, LH screening, and the LH test. For the inescapable shock portion of the test (Day 1), the animals were placed in one side of two-chambered shuttle boxes (34 cm height × 37 cm width × 18 cm depth; Coulbourn Instruments, Whitehall, PA), with the door between the chambers closed. Following a 5-minute adaptation period, 120 inescapable foot-shocks (0.45 mA, 15-second duration, randomized average intershock interval of 45 seconds) were delivered through the grid floor. During the screening session (Day 2), the mice were placed in one of the two chambers of the apparatus for 5 minutes. A shock (0.45 mA) was then delivered, and the door between the two chambers was raised simultaneously. Crossing over into the second chamber terminated the shock. If the animal did not cross over, the shock terminated after 3 seconds. A total of 30 screening trials of escapable shocks were presented to each mouse with an average of 30-second delay between each trial. Mice that developed helplessness behavior (>5 escape failures during the last 10 screening shocks) (Malberg and Duman, 2003) were treated with either saline (7.5 ml/kg), FLX (20 mg/kg), ketamine (10 mg/kg), 4-Cl-KYN (5, 25 or 125 mg/kg), or 7-Cl-KYNA (1 or 25 mg/kg) 24 hours following screening (Day 3). During the LH test phase (Day 4), the animals were placed in the shuttle boxes and, after a 5-minute adaptation period, a 0.45-mA shock was delivered concomitantly with door opening for the first five trials, followed by a 2-second delay for the next 40 trials. Crossing over to the second chamber terminated the shock. If the animal did not cross over to the other chamber, the shock was terminated after 24 seconds. A total of 45 trials of escapable shock was presented to each mouse with 30-second intertrial intervals. The number of escape failures was recorded for each mouse. To determine the prolonged efficacy of the drugs, mice were retested for helpless behavior after 7 days (i.e., on Day 11). Experiments were performed at 30 lux ambient light levels within the arena. Three days prior to the locomotor sensitization experiments (Days 1–3), mice were placed into individual open-field arenas (50 cm length × 50 cm width × 38 cm height; San Diego Instruments, San Diego, CA) for a 30-minute daily habituation period. Saline was then injected, and mice were assessed for another 90 minutes. 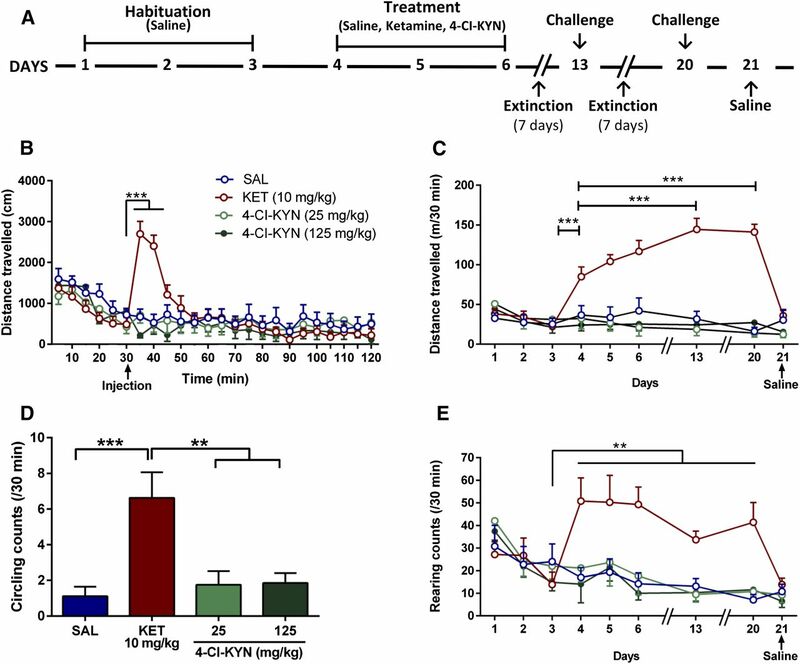 For the next 3 consecutive days (Days 4–6), mice were randomly divided into treatment groups and received injections after a 30-minute habituation period. Locomotor responses were then recorded for an additional period of 90 minutes. During Days 7–12 and 14–19, the animals received no injections. On Days 13 and 20, mice received a challenge treatment injection, and their locomotor activity was recorded. On Day 21, all mice received a saline injection to evaluate a possible contextual conditioning effect. Distance traveled was analyzed using TopScan v2.0 (CleverSys, Inc., Reston, VA) for a 30-minute period following the daily injection or 90 minutes for the acute effects of the drugs. Stereotypic rearing (vertical activity) and circling behavior were scored for the 30 minutes following the daily injections by a trained observer blind to the treatment groups. The conditioned-place preference (CPP) apparatus consisted of a rectangular Plexiglas three-chambered box (53 cm length × 15 cm width × 36 cm height) divided into three compartments (two equal-sized end-chambers and a middle “waiting” chamber) by two removable doors. One end-chamber (22 cm length × 15 cm width × 36 cm height) was composed of a 1-cm-spaced wired floor with four dark-gray walls (dark compartment), whereas the other end-chamber (same dimensions) had a 0.3-cm-spaced wired floor with white walls with black vertical stripes (1.5 cm; striped compartment). The middle compartment (9 cm length × 15 cm width × 36 cm height) had white Plexiglas floor and walls. The CPP protocol consisted of a habituation phase, a preconditioning test, six conditioning sessions, and a postconditioning test. On Day 1, mice were placed in the CPP apparatus for a 20-minute habituation period and were allowed to freely explore all chambers. On Day 2 (preconditioning phase), mice were placed in the CPP apparatus and were allowed to explore all compartments for a period of 20 minutes. During the conditioning phase, saline (7.5 ml/kg), ketamine (10 mg/kg), or 4-Cl-KYN (25 or 125 mg/kg) was administered, and mice were placed in their least-preferred compartment on alternating days (i.e., Days 3, 5, and 7). All groups of animals received saline (7.5 ml/kg) in their preferred compartment on Days 4, 6, and 8. During the postconditioning test session (i.e., Day 9), mice were placed in the CPP apparatus to freely explore all three compartments for 20 minutes. Time spent in each compartment was measured during the last 15 minutes of both pre- and postconditioning sessions, as previously described (Zanos et al., 2014). The prepulse inhibition (PPI) paradigm used was derived from previously published protocols (Chan et al., 2008), with minor modifications. Mice were individually tested in acoustic startle boxes (SR-LAB; San Diego Instruments, San Diego, CA). The animals first received an injection of saline, ketamine, or 4-Cl-KYN and were placed in the startle chamber for a 30-minute habituation period. The experiment started with a further 5-minute adaptation period during which the mice were exposed to a constant background noise (67 db), followed by five initial startle stimuli (120 db, 40-millisecond duration each). Subsequently, animals were exposed to five different trial types: pulse alone trials (120 db, 40-millisecond duration), three prepulse trials of 76, 81, and 86 db of white noise bursts (20-millisecond duration) preceding a 120-db pulse by 100 milliseconds, and background (67 db) no-stimuli trials. Each of these trials was randomly presented five times. The percentage prepulse inhibition (% PPI) was calculated using the following formula: [(magnitude on pulse alone trial – magnitude on prepulse + pulse trial)/magnitude on pulse alone trial] × 100. All values are expressed as the mean ± S.E.M. For analyses of the acute (i.e., 1-hour) and long-term (i.e., 24-hour) antidepressant-like efficacy in the FST and TST, one-way ANOVA was performed. Glycine pretreatment effects in the FST were assessed by a two-way ANOVA with ‘pretreatment’ (i.e., saline and glycine) and ‘treatment’ (i.e., saline and 4-Cl-KYN) as factors. Effects in the LH and NSF tests were analyzed by one-way ANOVA. Acute and behavioral sensitization effects in the open-field test were analyzed using two-way–repeated measures analysis of variance (ANOVA) with ‘treatment’ and ‘time’ as factors. CPP data were assessed by two-way–repeated measures ANOVA for factors ‘treatment’ and ‘CPP phase’ (i.e., pre-Cond, post-Cond). The data of startle amplitude and circling behavior were assessed by one-way ANOVA. The % PPI data were analyzed by two-way ANOVA for factors ‘treatment’ and ‘intensity’ (i.e., 76 db, 81 db, and 86 db). A Student’s t-test was used to compare the area under the curve (AUC) following 4-Cl-KYN or 7-Cl-KYNA administration, and to determine the effects of acute (1 hour postinjection) FLX administration, in the FST. All ANOVAs were followed by a Bonferroni post-hoc comparison when significance was reached (i.e., p < 0.05). All statistical analyses were performed using STATISTICA 10 (StatSoft Inc., Tulsa, OK). ANOVA results are presented in Table 1, while post-hoc comparisons are detailed in figures and text. 7-Cl-KYNA levels were not measurable in hippocampal microdialysates during the baseline collection period (0–2 hours; Fig. 1B). Extracellular 7-Cl-KYNA levels became detectable in mice that received 4-Cl-KYN or 7-Cl-KYNA (each 25 mg/kg), attaining peak concentrations of 100 ± 16 nM 1.5 hours after the administration of 4-Cl-KYN and 25 ± 5 nM 1 hour after the administration of 7-Cl-KYNA. Quantitative assessment of the AUC revealed approximately 10-times higher extracellular 7-Cl-KYNA levels for the 4-Cl-KYN-treated mice compared with 7-Cl-KYNA-treated animals (inset, Fig. 1B). Notably, considering a typical 10–20% recovery and time lag from the microdialysis procedure (Stahle et al., 1991), the peak extracellular concentration of 7-Cl-KYNA following administration of 4-Cl-KYN approximated its IC50 at the glycineB site [560 nM; Kemp et al. (1988)]. In vitro screening revealed only two receptors with Ki values of <10 μM for 7-Cl-KYNA (Supplemental Table S1 and Supplemental Fig. S1): β-adrenergic receptor subtype 1 (Ki: 3.95 μM) and muscarinic receptor subtype 5 (Ki: 2.81 μM). This contrasts with the IC50 of 7-Cl-KYNA at the glycineB site [560 nM; Kemp et al. (1988)] and indicates a lack of off-target effects of the compound. 4-Cl-KYN showed no affinity (<10 μM) for any of the possible targets assessed (Supplemental Table S1 and Supplemental Fig. S2). Antidepressant-Like Effects of 4-Cl-KYN in the Forced-Swim Test, Tail-Suspension Test, and Novelty-Suppressed Feeding Tests. To assess antidepressant-like properties in classic tests of antidepressant efficacy, mice were tested in the FST or TST 1 hour postinjection. Both ketamine (10 mg/kg) and 4-Cl-KYN (25 and 125 mg/kg) administration significantly decreased immobility time in the FST, compared with the saline-treated controls (Fig. 2A). A similar decrease in immobility was also observed after acute FLX administration (Fig. 2A). To examine whether systemic 7-Cl-KYNA administration itself elicits antidepressant-like effects in the FST, we administered the compound at three different doses (25, 75, or 225 mg/kg). Tested 1 hour later, only the highest dose of 7-Cl-KYNA resulted in significant antidepressant-like effects (saline: 157.4 ± 14.9 seconds; 25 mg/kg: 116.1 ± 18.5 seconds; 75 mg/kg: 125.4 ± 12.9 seconds; 225 mg/kg (P < 0.05): 81.3 ± 13.0 seconds; n = 7–8/group). The effective doses of ketamine and 4-Cl-KYN in the FST also significantly decreased immobility time in the TST (Fig. 2D). Notably, 4-Cl-KYN, in apparent contrast to ketamine (Li et al., 2010), elicited antidepressant actions across a rather broad dose range; however, our studies did not determine the maximally effective dose in either FST or TST. Antidepressant effects in the forced-swim, tail-suspension, and novelty-suppressed feeding tests. Mice received intraperitoneal injections of saline (SAL), fluoxetine (FLX), ketamine (KET), or 4-chlorokynurenine (4-Cl-KYN) and were tested in the FST 1-hour post-treatment. (A) Acute administration of FLX (n = 9/group; unpaired Student’s t-test) as well as KET and 4-Cl-KYN (n = 12–16/group; one-way ANOVA followed by Bonferroni’s multiple comparison) significantly reduced immobility in the FST. (B) Glycine pretreatment prevented the antidepressant-like effects of 4-Cl-KYN in the FST (n = 13–15/group; two-way ANOVA followed by Bonferroni’s multiple comparison). (C) Administration of NBQX prevented the antidepressant effects of both KET and 4-Cl-KYN in the FST (n = 11–14/group, two-way ANOVA followed by Bonferroni’s multiple comparison). (D) In the TST, administration of 4-Cl-KYN resulted in antidepressant-like effects 1 hour postinjection (n = 16/group; one-way ANOVA followed by Bonferroni’s multiple comparison). (E) Administration of KET and 4-Cl-KYN significantly reduced latency to feed in the NSF test, (F) without affecting home-cage food consumption (n = 10/group; one-way ANOVA followed by Bonferroni’s multiple comparison). Data are the mean ± S.E.M. *p < 0.05, **p < 0.01, ***p < 0.001. To determine whether these antidepressant-like effects of 4-Cl-KYN are attributable to glycineB site inhibition, we pretreated mice with glycine at a dose previously shown to reverse the behavioral effects of NMDA channel blockers in rodents [1.6 g/kg, i.p. ; Evoniuk et al. (1991); Javitt et al. (1999)]. Whereas glycine administration alone did not change immobility time of saline-treated animals in the FST, it prevented the antidepressant-like effects of 4-Cl-KYN (25 mg/kg) in this paradigm (Fig. 2B). Moreover, to mechanistically assess downstream mechanisms mediating the antidepressant effects of 4-Cl-KYN, we administered the AMPA receptor antagonist NBQX (10 mg/kg) 5 minutes prior to treatment with 4-Cl-KYN and assessed immobility time in the FST 1 hour later. Pretreatment with NBQX prevented the antidepressant effects of both ketamine and 4-Cl-KYN (Fig. 2C). To determine the capacity for rapid antidepressant action of 4-Cl-KYN, we assessed its effects in the NSF test, which is sensitive to monoamine-acting antidepressants only following chronic administration (Santarelli et al., 2003). Administration of both ketamine and 4-Cl-KYN rapidly decreased the latency to feed in the NSF arena compared with saline-treated mice (Fig. 2E). There were no significant differences between the amounts of food consumed by saline-, ketamine-, or 4-Cl-KYN-treated mice in their home cage assessed immediately following the NSF test (Fig. 2F). Sustained Antidepressant-Like Effects of 4-Cl-KYN in the 24-Hour FST. It has previously been reported that, in contrast to monoamine-acting antidepressants, ketamine elicits antidepressant actions in the FST 24 hours after administration, when ketamine is no longer present [e.g., Li et al. (2010); Autry et al. (2011)]. We therefore compared the antidepressant-like effects of ketamine and 4-Cl-KYN in the FST 24 hours following a single injection. Similar to ketamine (10 mg/kg), 4-Cl-KYN (25 or 125 mg/kg) significantly decreased immobility time compared with saline-treated animals (Fig. 3A). Consistent with its delayed time course of action in humans [e.g., Barr et al. (1997)], FLX (20 mg/kg) had no significant effect when it was administered a single time 24 hours prior to testing (Fig. 3A). Sustained antidepressant effects in the 24-hour forced-swim test and learned helplessness paradigms. Mice received intraperitoneal injections of saline (SAL), fluoxetine (FLX), ketamine (KET), 7-chlorokynurenic acid (7-Cl-KYNA), or 4-chlorokynurenine (4-Cl-KYN) and were tested in the FST 1 or 24 hours post-treatment, and in the LH paradigm 24 hours and 7 days following treatment. (A) While FLX administration did not induce antidepressant effects, both KET and 4-Cl-KYN significantly reduced immobility time in the FST and decreased the number of escape failures in the LH paradigm at (B) 24 hours or (C) 7 days (n = 10–11/group; one-way ANOVA followed by Bonferroni’s multiple comparison). Injections of FLX or 7-Cl-KYNA did not replicate the effects of 4-Cl-KYN in the LH paradigm 24 hours (D) or 7 days (E) post-treatment (n = 8–9/group; one-way ANOVA followed by Bonferroni’s multiple comparison). Data are the mean ± S.E.M. *p < 0.05, **p < 0.01, ***p < 0.001. ns, not significant. Antidepressant Effects of 4-Cl-KYN in the Learned Helplessness Paradigm. Mice that developed helpless behavior (∼50% of the mice having experienced inescapable foot shocks) were randomly assigned to treatment groups, receiving single injections of saline, ketamine (10 mg/kg), 4-Cl-KYN (25 mg/kg), FLX (20 mg/kg), or 7-Cl-KYNA (1 or 25 mg/kg). 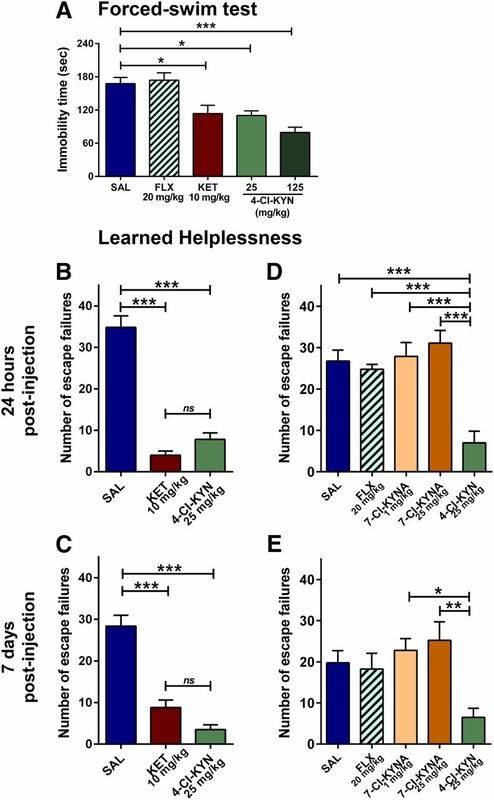 Both ketamine and 4-Cl-KYN significantly reduced helpless behaviors as assessed by the number of escape failures compared with saline-treated controls (Fig. 3, B and D). Notably, the antidepressant-like effects of both ketamine and 4-Cl-KYN persisted when the animals were retested 7 days later (Fig. 3, C and E). In contrast, FLX- and 7-Cl-KYNA-treated mice did not manifest antidepressant-like effects 24 hours or 7 days postinjection (Fig. 3, D and E). 4-Cl-KYN Does Not Affect Behaviors in the Open Field. Acute administration of 4-Cl-KYN (25 or 125 mg/kg) did not cause ketamine-like acute hyperlocomotor activity in the open-field compared with saline-treated controls (Fig. 4B). In the same mice, we assessed possible locomotor sensitization effects following repeated saline, ketamine, or 4-Cl-KYN injections. Administration of ketamine, but not of 4-Cl-KYN, on Days 13 and 20 revealed a significant increase in locomotor activity compared with the acute motor-enhancing effects (Day 4), indicating locomotor sensitization (Fig. 4C). No effect was seen when saline was administered on Day 21. Open-field behaviors. (A) Behavioral sensitization protocol. Acute intraperitoneal administration of 4-chlorokynurenine (4-Cl-KYN) did not have effects similar to intraperitoneal ketamine (KET) on (B) acute hyperlocomotion (n = 7–9/group; two-way ANOVA followed by Bonferroni’s multiple comparison) or (C) locomotor sensitization (n = 7–9/group; two-way ANOVA followed by Bonferroni’s multiple comparison). Unlike KET, 4-Cl-KYN administration was not associated with (D) increased stereotypic circling (n = 7–9/group; one-way ANOVA followed by Bonferroni’s multiple comparison) or (E) rearing behavior (n = 7–9/group; two-way ANOVA followed by Bonferroni’s multiple comparison). Data are the mean ± S.E.M. **p < 0.01, ***p < 0.001. Similar to other compounds with stimulant properties [e.g., Morency et al. (1987)], administration of ketamine, but not of 4-Cl-KYN, caused significant circling behavior following acute administration on Day 4, compared with saline controls (Fig. 4D). Animals did not manifest maintenance of this effect on subsequent days (data not shown). Moreover, injection of ketamine, but not of 4-Cl-KYN, induced a significant increase in repetitive vertical activity (rearing) on the first day of drug injection (Day 4; Fig. 4E). No sensitization to this effect was observed (Fig. 4E). 4-Cl-KYN Does Not Elicit Conditioned Place Preference. Ketamine-treated (10 mg/kg) mice exhibited a robust CPP, as illustrated by an increase in the time spent in the drug-paired compartment during the postconditioning phase compared with the preconditioning phase (Fig. 5A). In contrast, administration of 4-Cl-KYN (25 or 125 mg/kg) did not induce CPP (Fig. 5A). Additionally, analysis of the ratio of the time mice spent in the drug-paired compartment during the postconditioning phase and preconditioning session indicated a significant increase in the preference of ketamine-treated mice to spend their time in the drug-paired compartment compared with saline-treated mice. Conditioned-place preference and prepulse inhibition. (A) Time spent in the drug-paired compartment during the postconditioning test revealed place preference conditioning to ketamine (KET) but not to 4-chlorokynurenine (4-Cl-KYN) (n = 7–8/group; two-way ANOVA followed by Bonferroni’s multiple comparison). KET caused a (B) dose-dependent disruption of prepulse inhibition (% PPI; two-way ANOVA followed by Bonferroni’s multiple comparison), (C) but did not alter the startle amplitude (one-way ANOVA followed by Bonferroni’s multiple comparison). 4-Cl-KYN did not inhibit (D) % PPI (two-way ANOVA followed by Bonferroni’s multiple comparison) or (E) startle amplitude (one-way ANOVA followed by Bonferroni’s multiple comparison) (n = 11–12/group). Data are the mean ± S.E.M. ; *p < 0.05, **p < 0.01, ***p < 0.001; ns, not significant. 4-Cl-KYN Does Not Disrupt Prepulse Inhibition. Ketamine administration dose-dependently disrupted % PPI, with 30 mg/kg found to be the lowest significantly effective dose (Fig. 5B). In contrast, 4-Cl-KYN administration did not induce significant alterations in % PPI at any dose tested (25, 125, or 375 mg/kg; Fig. 5D). Neither ketamine nor 4-Cl-KYN affected startle amplitude at any dose (Fig. 5, C and E). 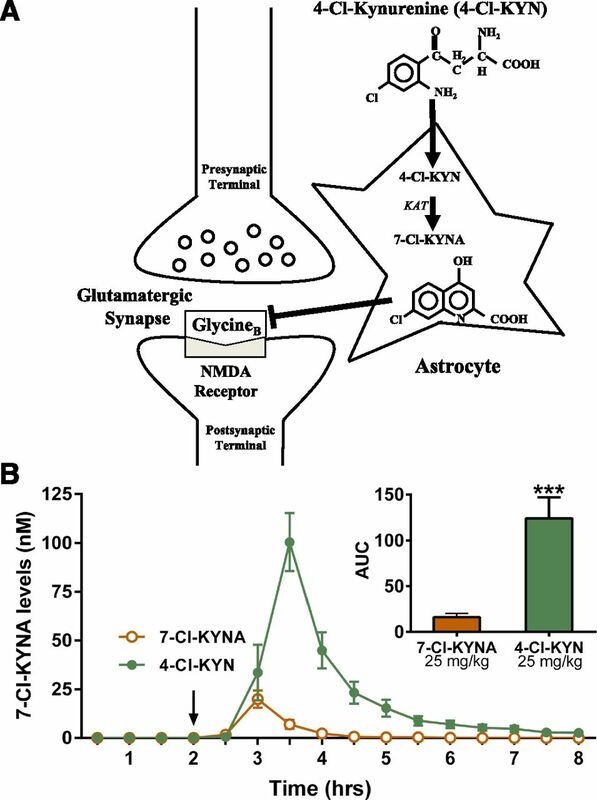 The present study demonstrated that systemic administration of 4-Cl-KYN, the brain-penetrant prodrug of the glycineB-site antagonist 7-Cl-KYNA, results in ketamine-like antidepressant-like effects in mice. In particular, we observed acute, dose-dependent effects of 4-Cl-KYN in the FST and the TST, and showed that antidepressant-like efficacy was maintained for 24 hours in the FST. Moreover, 4-Cl-KYN showed remarkable efficacy in the LH paradigm, where the effect was evident up to 7 days after a single treatment, at a time point past which 7-Cl-KYNA had become undetectable in brain microdialysate (Fig. 1B). In addition, 4-Cl-KYN administration rapidly decreased the latency to feed in the NSF test. All these antidepressant-like effects were qualitatively identical, and quantitatively very similar, to those of ketamine, which was tested in parallel using a well-established antidepressant dose for mice [10 mg/kg; Maeng et al. (2008); Ma et al. (2013)]. We confirmed that the antidepressant-like action of 4-Cl-KYN in the acute FST involves the glycineB site, since pretreatment with glycine prevented the effects at the same dose shown to increase concentrations of glycine in the brain (albeit by less than a 2-fold difference) and to reverse the behavioral effects of NMDA channel blockers (Trullas and Skolnick, 1990; Evoniuk et al., 1991; Javitt et al., 1999). In support, no off-site receptor targets were identified by the extensive receptor screening performed (Supplemental Figs. S1 and S2 and Supplemental Table S1). Moreover, in line with the hypothesis that ketamine’s antidepressant mechanism involves enhanced synaptic glutamate release and activation of postsynaptic AMPA receptors (Li et al., 2010; Duman and Aghajanian, 2012), administration of an AMPA receptor antagonist completely prevented the behavioral effects of 4-Cl-KYN in the FST. Notably, effective doses of 4-Cl-KYN did not produce rewarding or aversive properties in the CPP paradigm, and were not associated with locomotor stimulation, stereotypic behaviors, or disruption of PPI, all of which are typically induced by ketamine and other NMDA receptor channel blockers. A major drawback of monoamine-based antidepressant medications that are currently in clinical use is that they require sustained treatment of several weeks or longer before therapeutic benefits are achieved (Rush et al., 2006). The ineffectiveness of acute FLX administration in the 24-hour FST and LH paradigms markedly contrasts with the actions of ketamine, which have been documented in recent animal studies (Maeng et al., 2008; Li et al., 2010; Autry et al., 2011; Browne and Lucki, 2013). On the basis of the theoretical construct introduced by Skolnick and collaborators (1996), this pharmacological disparity in the effects of acute dosing can be explained at least partly by the fact that clinical effects of monoaminergic drugs do not become apparent until NMDA receptors are downregulated following a delay period. Subsequently, the reduction of NMDA receptor function initiates a cascade of molecular and cellular events that may cumulatively account for the benefits seen in MDD patients [see Skolnick et al. (1996)]. This conceptual framework reconciles the monoamine and glutamate hypotheses of MDD pathophysiology and accounts for the current interest in glutamatergic modulators as rapid-acting medications for the treatment of the disease. In the present study, 4-Cl-KYN was used as a prodrug of 7-Cl-KYNA, which is frequently employed as an experimental tool to selectively probe the glycineB receptor in vitro, or following intracerebral application in vivo (Kemp et al., 1988; Wu et al., 1997). After peripheral administration, 4-Cl-KYN gains rapid access to the brain via the large neutral amino acid transporter (Hokari et al., 1996) and is then promptly accumulated by astrocytes. Subsequently, 4-Cl-KYN is irreversibly converted to 7-Cl-KYNA by kynurenine aminotransferase, and the newly produced glycineB receptor antagonist is then rapidly released into the extracellular milieu (Kiss et al., 2003) (cf., Fig. 1A). Unlike 4-Cl-KYN (Hokari et al., 1996), 7-Cl-KYNA crosses the blood-brain barrier very poorly, probably because of its polar nature and the lack of an active transport system (Leeson and Iversen, 1994). In the present study, we confirmed the formation of 7-Cl-KYNA from systemically administered 4-Cl-KYN by in vivo microdialysis in the hippocampus of freely-moving mice. A recent double-blind, placebo-controlled trial demonstrated that long-term (6-week) administration of the glycineB partial agonist d-cycloserine has antidepressant effects in humans (Heresco-Levy et al., 2013). Antidepressant-like effects of glycineB-modulating compounds have been previously reported in behavioral tests that are also sensitive to monoamine-acting drugs (e.g., the FST and TST). For example, Poleszak et al. (2011) showed antidepressant-like efficacy of the brain-penetrating, specific glycineB antagonist L-701,324 and of d-cycloserine in the FST in mice. However, few studies have addressed effects in “ketamine-sensitive” paradigms (i.e., 24-hour FST, LH, and NSF). This is important as ketamine represents a first-in-class new generation rapid-acting antidepressant drug. A notable exception is GLYX-13, an amidated tetrapeptide, which can act as a partial agonist of the glycineB receptor and has rapid-acting antidepressant effects in the 24-hour FST, LH, and NSF tests (Burgdorf et al., 2013). Since the endogenous ligands of the glycineB receptor—glycine and d-serine—are present at high levels in brain, it is hypothesized that at high concentrations glycineB receptor partial agonists act as functional antagonists in vivo by reducing the facilitating effect of glycine and/or d-serine (Clos et al., 1996). However, the involvement of the glycineB site of the NMDA receptor in the antidepressant effects of GLYX-13 has not been directly demonstrated so far. Maj et al. (1994) described antidepressant-like effects following repeated, but not single, administration of 7-Cl-KYNA (20 mg/kg) in the FST, and acute antidepressant-like effects were seen after a single injection of low doses of 7-Cl-KYNA in rats (Zhu et al., 2013; Liu et al., 2015). However, the latter findings were not replicated in our experiments. In contrast, i.p. administration of lower doses of 4-Cl-KYN, the brain-penetrant bioprecursor of 7-Cl-KYNA, exerted rapid and sustained ketamine-like effects in tests that distinguish ketamine from monoamine-acting antidepressants. Reversal of antidepressant effects with glycine supported the concept that the antidepressant-like actions of 4-Cl-KYN involved inhibition of the glycineB site of the NMDA receptor. Possible side effects of 4-Cl-KYN were examined by assessing locomotor activity, stereotypic behaviors, PPI, CPP, and behavioral sensitization. Unlike ketamine, 4-Cl-KYN produced none of these effects at any of the doses tested. This indicates that antagonism of the glycineB site with 4-Cl-KYN does not appear to elicit the detrimental side effects (e.g., psychotomimetic and rewarding) that are associated with the use of ketamine or other NMDA channel blockers (Mansbach, 1991; Papp and Moryl, 1994). The advantages of targeting the glycineB site may be linked to the different mechanisms by which inhibition of the co-agonist site and channel blockade reduce NMDA receptor function (Danysz and Parsons, 1998). Alternatively or in addition, the detrimental effects of ketamine, as well as other NMDA channel blockers, including phencyclidine and MK-801, may be related to the fact that these compounds have been reported to directly influence dopaminergic transmission by reducing dopamine reuptake (Nishimura and Sato, 1999) or facilitating dopamine release (Uchihashi et al., 1992). Notably, we demonstrated here that neither 4-Cl-KYN nor 7-Cl-KYNA have significant affinity for a large number of monoaminergic and other possible targets. In summary, the present study supports the hypothesis that antagonism of the glycineB co-agonist site of the NMDA receptor constitutes a promising approach for the treatment of major depression. Specifically, our results highlight the potential of 4-Cl-KYN as a next-generation, rapid-acting antidepressant medication, with a safer side-effect profile than ketamine. Since the prodrug uses astrocytes for delivery of the active compound, the efficacy of our approach may be further enhanced by the fact that it could specifically buttress astrocyte function, which is impaired in individuals with MDD (Etievant et al., 2013; Rajkowska and Stockmeier, 2013). Importantly, in a Phase 1, randomized, dose-escalation study evaluating safety and pharmacokinetics of single doses of orally administered 4-Cl-KYN in healthy volunteers, the drug did not cause any serious adverse events (ClinicalTrials.gov Identifier: NCT01483846), indicating a potential for clinical trials in MDD patients. 4-Cl-KYN was provided by VistaGen Therapeutics, Inc. Receptor binding profiles and Ki determinations were generously provided by the NIMH Psychoactive Drug Screening Program, Contract No. HHSN-271-2008-025C, directed by Dr. Bryan Roth (University of North Carolina, Chapel Hill, NC) in conjunction with Ms. Jamie Driscoll (NIMH, Bethesda, MD). Participated in research design: Zanos, Piantadosi, Zarate Jr., Schwarcz, Gould. Conducted experiments: Zanos, Piantadosi, Wu, Pribut, Can. Contributed new reagents or analytic tools: Snodgrass. Performed data analysis: Zanos, Piantadosi, Dell. Wrote or contributed to the writing of the manuscript: Zanos, Piantadosi, Schwarcz, Gould. This study was supported by the National Institutes of Health National Institute of Mental Health (Grant No. MH099345). This work was supported by the Intramural Research Program of the National Institutes of Health. (2014) Antidepressant effect of ketamine in sub anaesthetic doses in male albino mice. J Clin Diagn Res 8:HC05–HC07. (1997) Effects of fluoxetine administration on mood response to tryptophan depletion in healthy subjects. Biol Psychiatry 41:949–954. (2012) Automated design of ligands to polypharmacological profiles. Nature 492:215–220. (2013) Antidepressant effects of ketamine: mechanisms underlying fast-acting novel antidepressants. Front Pharmacol 4:161. (2012) The tail suspension test. J Vis Exp 59:3769. (2008) Attenuation of ketamine-evoked behavioral responses by mGluR5 positive modulators in mice. Psychopharmacology (Berl) 198:141–148. (1996) Effect of 1-aminocyclopropanecarboxylic acid on N-methyl-D-aspartate-stimulated [3H]-noradrenaline release in rat hippocampal synaptosomes. Br J Pharmacol 118:901–904. (1998) Glycine and N-methyl-D-aspartate receptors: physiological significance and possible therapeutic applications. Pharmacol Rev 50:597–664. (2014) Pathophysiology of depression and innovative treatments: remodeling glutamatergic synaptic connections. Dialogues Clin Neurosci 16:11–27. (2012) Synaptic dysfunction in depression: potential therapeutic targets. Science 338:68–72. (2013) Astrocytes and gliotransmitters: new players in the treatment of major depression? Curr Drug Targets 14:1295–1307. (1991) A rapid method for evaluating the behavioral effects of phencyclidine-like dissociative anesthetics in mice. Psychopharmacology (Berl) 105:125–128. (2013) A randomized add-on trial of high-dose D-cycloserine for treatment-resistant depression. Int J Neuropsychopharmacol 16:501–506. (1996) Facilitated brain uptake of 4-chlorokynurenine and conversion to 7-chlorokynurenic acid. Neuroreport 8:15–18. (1999) A.E. Bennett Research Award. Reversal of phencyclidine-induced effects by glycine and glycine transport inhibitors. Biol Psychiatry 45:668–679. (2003) Kynurenate production by cultured human astrocytes. J Neural Transm 110:1–14. (1994) Subanesthetic effects of the noncompetitive NMDA antagonist, ketamine, in humans. Psychotomimetic, perceptual, cognitive, and neuroendocrine responses. Arch Gen Psychiatry 51:199–214. (2001) Excitotoxic injury stimulates pro-drug-induced 7-chlorokynurenate formation in the rat striatum in vivo. Neurosci Lett 304:185–188. (1994) The glycine site on the NMDA receptor: structure-activity relationships and therapeutic potential. J Med Chem 37:4053–4067. (2010) mTOR-dependent synapse formation underlies the rapid antidepressant effects of NMDA antagonists. Science 329:959–964. (2015) 7-Chlorokynurenic acid (7-CTKA) produces rapid antidepressant-like effects: through regulating hippocampal microRNA expressions involved in TrkB-ERK/Akt signaling pathways in mice exposed to chronic unpredictable mild stress. Psychopharmacology (Berl) 232:541–550. (2013) Long-lasting antidepressant action of ketamine, but not glycogen synthase kinase-3 inhibitor SB216763, in the chronic mild stress model of mice. PLoS One 8:e56053. (2008) Cellular mechanisms underlying the antidepressant effects of ketamine: role of alpha-amino-3-hydroxy-5-methylisoxazole-4-propionic acid receptors. Biol Psychiatry 63:349–352. (1994) Some central effects of kynurenic acid, 7-chlorokynurenic acid and 5,7- dichloro-kynurenic acid, glycine site antagonists. Pol J Pharmacol 46:115–124. (1991) Effects of NMDA receptor ligands on sensorimotor gating in the rat. Eur J Pharmacol 202:61–66. (1987) Circling behavior following unilateral microinjections of cocaine into the medial prefrontal cortex: dopaminergic or local anesthetic effect? J Neurosci 7:812–818. (1999) Ketamine stereoselectively inhibits rat dopamine transporter. Neurosci Lett 274:131–134. (1994) Rewarding properties of non-competitive and competitive NMDA antagonists as measured by place preference conditioning in rats. Pol J Pharmacol 46:79–81. (2007) The NMDA receptor as a therapeutic target in major depressive disorder. CNS Neurol Disord Drug Targets 6:101–115. (2007) Activation of the NMDA/glutamate receptor complex antagonizes the NMDA antagonist-induced antidepressant-like effects in the forced swim test. Pharmacol Rep 59:595–600. (2011) A complex interaction between glycine/NMDA receptors and serotonergic/noradrenergic antidepressants in the forced swim test in mice. J Neural Transm 118:1535–1546. (2012) The stressed synapse: the impact of stress and glucocorticoids on glutamate transmission. Nat Rev Neurosci 13:22–37. (2010) Reduction of endogenous kynurenic acid formation enhances extracellular glutamate, hippocampal plasticity, and cognitive behavior. Neuropsychopharmacology 35:1734–1742. (1998) Anxiolytic- and antidepressant-like effects of an antagonist at glycineB receptors. Pol J Pharmacol 50:349–354. (2013) Astrocyte pathology in major depressive disorder: insights from human postmortem brain tissue. Curr Drug Targets 14:1225–1236. (2006) Acute and longer-term outcomes in depressed outpatients requiring one or several treatment steps: a STAR*D report. Am J Psychiatry 163:1905–1917. (1994) Enzyme-activated antagonists of the strychnine-insensitive glycine/NMDA receptor. J Med Chem 37:334–336. (2012) Towards a glutamate hypothesis of depression: an emerging frontier of neuropsychopharmacology for mood disorders. Neuropharmacology 62:63–77. (1996) Adaptation of N-methyl-D-aspartate (NMDA) receptors following antidepressant treatment: implications for the pharmacotherapy of depression. Pharmacopsychiatry 29:23–26. (1991) A comparison between three methods for estimation of extracellular concentrations of exogenous and endogenous compounds by microdialysis. J Pharmacol Methods 25:41–52. (1990) Functional antagonists at the NMDA receptor complex exhibit antidepressant actions. Eur J Pharmacol 185:1–10. (1992) Assessment of the ambulation-increasing effect of ketamine by coadministration with central-acting drugs in mice. Jpn J Pharmacol 60:25–31. (2007) VEGF is an essential mediator of the neurogenic and behavioral actions of antidepressants. Proc Natl Acad Sci USA 104:4647–4652. (1997) Enzyme-catalyzed production of the neuroprotective NMDA receptor antagonist 7-chlorokynurenic acid in the rat brain in vivo. Eur J Pharmacol 319:13–20. 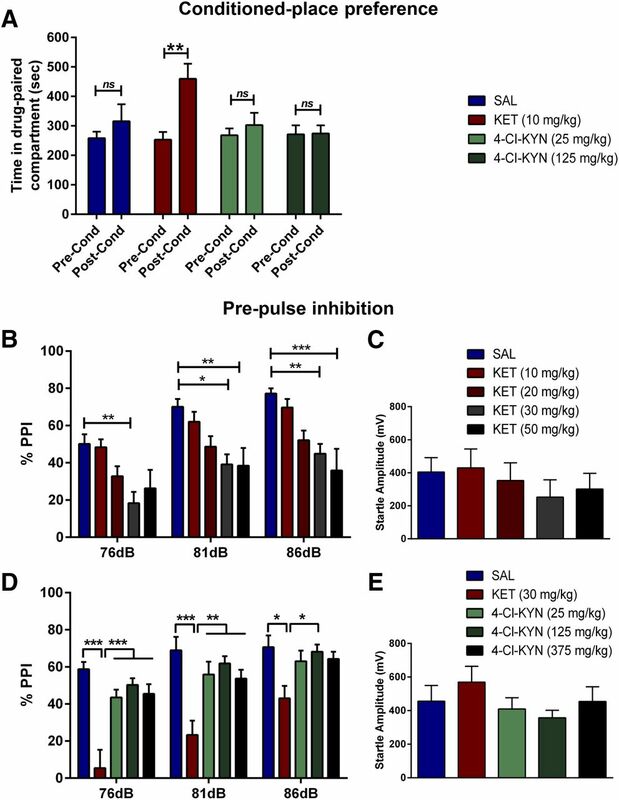 (2014) The oxytocin analogue carbetocin prevents emotional impairment and stress-induced reinstatement of opioid-seeking in morphine-abstinent mice. Neuropsychopharmacology 39:855–865. (2013) Glycine site N-methyl-D-aspartate receptor antagonist 7-CTKA produces rapid antidepressant-like effects in male rats. J Psychiatry Neurosci 38:306–316.